If you can, go around your neighborhood and collect food from your neighbors, the more them merrier but, don’t stress! Good luck and have fun. Pickup bags will be given out on 10/24/17 and 10/31/17. Good luck and have fun. Drive on Friday, November 10th at noon through Sunday, November 12th at noon. Venturers, and their family members. 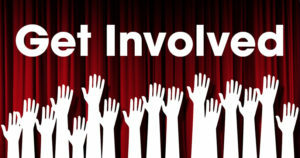 Cornerstone Food Pantry, the John Wrigley Food pantry and more. Do you know anybody willing to help? Give them the following poster!! Do you have any questions about the Thanks for Giving food drive? Click on this link to go to the latest facts about the Thanks for Giving Food Drive!! What does the Food Drive need? The Thanks for Giving food drive in 2016 collected over 20,944 food items. They need your help as much as possible. At the begging of the day before the pick up from the shops is gathered we need as much food as possible. Below is the list of items need to help families in need. Thanks for Giving!! The food drive is also in need of sponsors. Such a big event needs lots of food to start of. 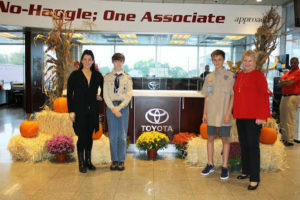 If you know any companies who would be willing to help gather food, contact Mr. Mercaldo at thx4giving@troop1milford.org. Food can be donated to the food drive but some expired food will be used and have to be thrown away so please encourage no expired food. This is not a place where you can dump your unused food. sort, let Mr. Mercaldo asap so that he can plan what is going to happen. 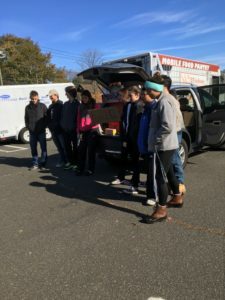 Milford Scouts will again lend helping hands to collect and sort food over a 48-hour period so that Milford’s less fortunate families can celebrate Thanksgiving this year. 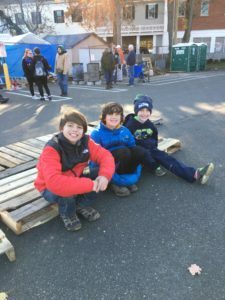 Troop 1 of Milford will host the event this year supported by more than a dozen other Boy Scout, Cub Scout and Girl Scout units. The scouts will camp out at Milford’s Wasson Field over 2 days, collecting and sorting food donations from residents and local supermarkets. They are collecting frozen turkeys, non-perishable food items and monetary donations with all proceeds going to the cause. 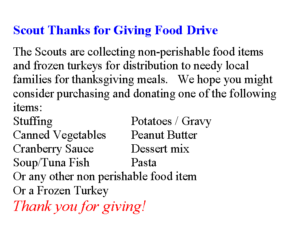 Over the last eleven years, Milford scouts have collected more than 70,000 pounds of food and 1,600 turkeys.